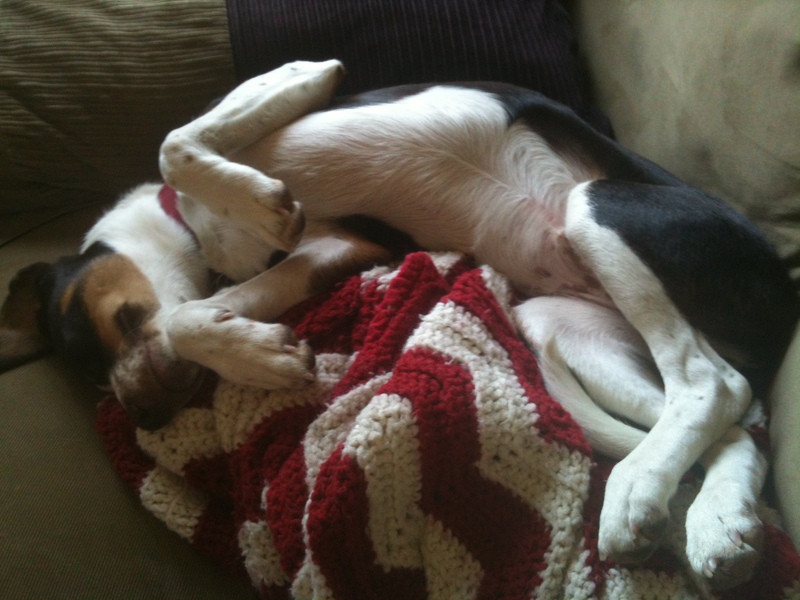 When mommy and daddy are away, Charlie will … snooze on the couch. Overall, I’d say the week with Matt away on business has been a success. Charlie mostly followed the rules. But it seemed every time he was doing something absolutely adorable, he happened to be sitting on the couch. Which is off limits. Totally forbibben, if Matt is listening. Still, we found a comfortable routine. I refereed as Lexie adjusted to eating soft food. Of course, Charlie was eager to help out. My job was to redirect his enthusiasm toward his bowl of puppy chow. I threw the ball, but not as good as Matt. Charlie quickly lost interest after a threw the fluffy bone 10 feet. I don’t blame him. The only bone of contention was the couch. But seriously, how much training could I really unravel in a week? Considering I still have a working phone and the house is still standing, I’m calling this a victory. I’m thinking of bringing the dogs when I go to the airport to pick up Matt. He’ll be back in a couple hours. Hey … where the heck is Charlie? Oh my. Charlie is on his dog bed taking a nap. Where’s my camera? Matt will never believe this. This entry was posted in Woof! and tagged adopt, border collie, dog, pets, puppy by ourfureverfamily. Bookmark the permalink.